Fathers Day is just a few days away which has many people wondering what to get their dad. Solar Cigarette just released their 27% off fathers Day promotion code! The Solar Cigarette has given many smokers a new outlook on life because of its 2nd generation design. Not only does the Solar Cigarette electronic cigarette help smokers fight their nicotine cravings and let them feel as if they were really smoking, but it also helps them live a healthier lifestyle with the use of vitamin pack cartridge refills. 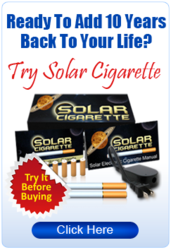 The Solar Cigarette Starter Kit is a unique smokeless cigarette package that not only helps smokers fight their nicotine cravings, but it also helps prevent smokers from gaining weight, even after they stop smoking. The patent pending 2nd Generation electronic cigarette is the first of its kind to offer vitamin packs that gives the smoker a small dose of healthy vitamins each time they puff on it. A representative of SolarCigarette.com states that clients and potential clients of Solar Cigarette can now get 27% off their next purchase of the Solar Cigarette and accessories by using coupon code DAD upon checkout. This coupon is limited and will only be available until midnight June 16, 2012.